4-room house 70 m2 on 2 levels, on the ground floor. Practical furnishings: living/dining room with sloping ceilings with satellite TV. 1 double bedroom with sloping ceilings. Kitchenette (oven, electric coffee machine). Bath or shower/WC. Upper floor: 2 rooms with sloping ceilings, each room with 2 beds. Terrace. Terrace furniture. Facilities: children's high chair (extra). Please note: non-smoking house. Maximum 1 pet/ dog allowed. Entrance to the upper floor via a spiral staircase. Each house is made from wood. 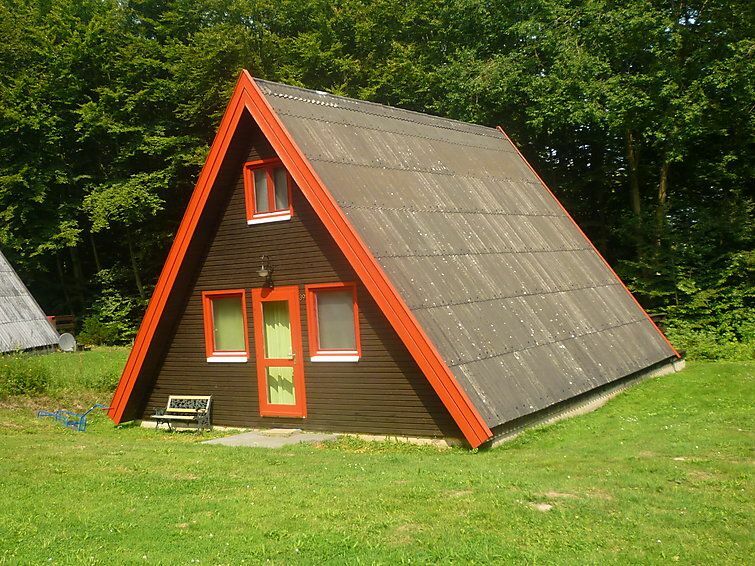 Some chalets are wooden and some chalets are log cabins and could also have a different layout: 4 room house 70m2, on the ground floor: living/dining room with satellite TV. 1 double bedroom. Kitchenette (oven, electric coffee machine). Two bedrooms with 1 x 2 bunk beds. Shower/WC. Terrace with terrace furniture. Child-friendly holiday village Arolsen-Twistesee. Outside the resort, 3 km from the centre of Bad Arolsen, in a quiet position, 300 m from the lake, in the woods. For shared use: table tennis (extra), children's playground. In the complex: reception, central heating system, washing machine (extra), tumble dryer (for shared use, extra). Central parking spaces. Shop 3 km, supermarket 3 km, restaurant 200 m, bus stop 3 km, railway station Bad Arolsen 4 km, outdoor swimming pool 3.5 km, indoor swimming pool 3.5 km. Golf course (9 hole) 500 m, riding stable 2 km. Please note: car-free holiday complex, car recommended. The photograph shows a typical example. All houses/apartments are individually designed/furnished. Bicycle rental 2 km. The holiday village with 95 holiday houses in timber construction (log cabins or A-frame (house), mini golf (extra) and volleyball court is located above the Twistestausees (pedestrian area, no traffic) with all water sports, water skiing and boat rentals (motor and sailboats are not allowed). Rental luggage cart (central parking spaces) available. The entire holiday park is pedestrian zone. PLEASE NOTE: On Sundays and public holidays no arrival and departure possible. TRAVEL AND SAVING: 21 days stay, 16 days pay or 14 days stay, 11 days pay in period from 24.11.18 to 29.06. and from 24.08.19. Sehr sauber,gemühltlich. Es hat uns an nichts gefehlt. Einfach klasse! sehr gut, ruhig, möglichkeit zum Spazieren, restaurants, Schwimbad in Arolsen, und am Twistesee, Spielzeug und Minigolf im Ferienpark. Wir hatten einen sehr schönen Winterurlaub. Die Wohnung war sehr gemütlich eingerichtet.